Shutsudou! 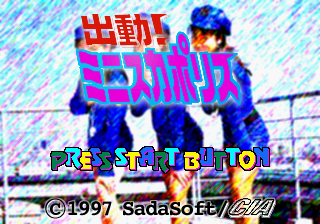 Miniskirt Police (出動！ミニスカポリス) is a table game published by Sada Soft and developed by Genki for the Sega Saturn. A limited edition version of the game comes with a mini audio CD and miniskirt police figure. Main article: Shutsudou! Miniskirt Police/Magazine articles.